I discovered a hidden gem! Innocent and elegant, The Deli certainly deserves more credit than it’s conventional name. This is no ordinary deli for sure with it’s scrumptious gourmet sandwiches to its luscious soups and gorgeous desserts. Thanks to Mi Casa and April Yim for the invitation to check out the newly open deli in the hotel itself. I was told that The Deli is helmed by the same chef from Cilantro, Chef Takashi Kimura. No wonder the food shouts quality and wholesomeness. Chef Takashi is famous for French cooking with Japanese influence in his menu at Cilantro and has served many royalties and dignitaries over the years. He also believes in using local ingredients to achieve the best out of his dishes. The saying ‘Never judge a book by it’s cover!” certainly applies here. Understated décor and elegant environment really makes one feel comfortable and relax to enjoy a sublime meal without being overdressed. The simple chalk board features a modest menu with affordable prices. Perfect precision skills from Chef Takashi really shows in his selection of the menu which consists of light salads and soups, gourmet sandwiches and a few main dishes with gorgeous in house desserts made from the chef himself! Various condiments such as ketchup, chili, mustard, pepper and even vinegar to accompany the menu. Whats life without condiments to spice it up? The Deli offers fruit juice in bottles from Australia, soft drinks, and a wide selection of coffee and tea. 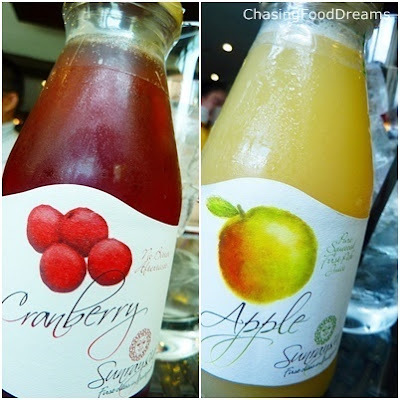 I had the cranberry and apple and both were excellent with fruity flavors and natural sweetness. 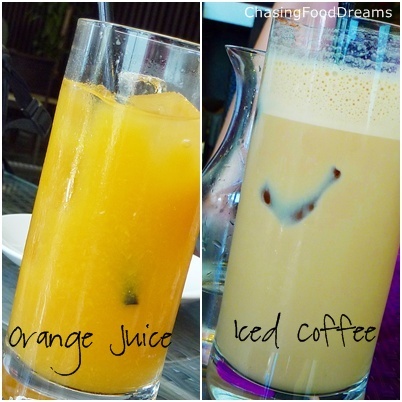 Others had orange and iced coffee which looked really good as well. First dish to impress me was the Caesar Salad. Fresh and crispy Romaine lettuce, crunchy croutons, crisp bacon, generous amount of finely shaved parmesan cheese and the piece de resistant, a perfectly poached egg all harmonized brilliantly together! As soon as the poached egg burst, the glorious golden yolk coats all the ingredients slightly, making the salad smooth and earthy with the saltiness of the cheese and Caesar dressing counter balancing the taste. Something so humble and yet so satisfying! When I heard they served French Onion Soup, I glee with joy! My absolute favorite soup and this is a must order for me when I see it. Usually made from beef stock, the onion soup here is made from chicken stock to cater to non-beef eaters. When the soup arrived, everyone commented that the soup was really fragrant. Covered by a layer of baguette with gooey melted cheese, everyone decided to have an order on their own...hahaha. The soup was bursting with caramelized soft onions and brings an earthiness to my soul. I just cannot resist showing off the baguette soaked with onion soup and topped with melted Gruyere cheese. The taste was divine and luscious. It was lighter compared to other onion soups I had but the taste was top notch. For me, this is what I call comfort food at its best! We also had the pasta of the day, Lamb Shank Fettuccine. Simple and no frill, this pasta is delicious. Lamb shank braised till tender and wonderfully savory, this pasta cooked al dente is rich and comforting. One can choose Ciabatta, Baguette or Wholemeal for all the sandwiches served here. Grilled Beef on Ciabatta came highly recommended for beef lovers. This beef lover contested that this is certainly a beautiful sandwich. Juicy grilled beef pieces were cooked perfectly medium, topped with fresh greens and divine caramelized onions, served with beef jus and French fries on the side. I just love the beef jus soaking up the bread and making it full of beefy goodness! Salmon Gravlax with Baguette was average for me. Salty and creamy, the salmon gravlax was well cured and topped with fresh watercress and a creamy sauce. I must say the French fries were really good as we polish off all the plates of fries with every sandwich effortlessly. Another favorite of mine is the Chicken Patè on Wholemeal. Somehow, the chunky pate really stands out for me. Well seasoned and generously thick cut of pate, snuggly wrapped between crunchy pickles and greens, I like this a lot. Most Patès are over salted but I think Chef Takashi did a great job with this one! Despite being full to the max, Grilled Mushrooms on Ciabatta appeared and looked so tempting. We were amazed again on the perfectly poached egg! Once the egg popped, the orange liquid yolk flowed over the grilled mushrooms like golden lava. I only took a small bite but it was enough to savor the smokiness and rich flavors of the combination. Every dish was really a class on its own! High quality ingredients and simplicity of the preparation really brings out the magnificent flavors of the dishes. Just when I thought I could not eat anymore, out came desserts. There is always room for desserts…J! We were treated to four flavors of Swiss Rolls made by the chef himself. These Swiss Rolls was gigantic in size and loaded with lots of cream beautifully coated on the inside. Vanilla Swiss Roll with Fruits was a myriad of colors. Fluffy vanilla sponge with fresh cream and mixed chopped fruits was light and creamy. Chocolate Swiss Roll was my favorite among the four. Dark, bittersweet and luscious, I adore the complex flavors of the chocolate. Caramel Swiss Roll was the most aromatic one among the Swiss rolls. Deep intense caramel scent was heavenly to the nostrils. Beautifully caramelized, the fluffy roll with its caramel cream was a hit among all of us. Green Tea Swiss Roll with Azuki paste was a sight to behold. Gorgeously green, the flavor was really a harmonious yin and yang with the thick red bean paste. Homemade Ice Creams were greeted by us with great excitement. The beautiful pastel colors of the ice creams were acknowledged quickly by our cameras before we dived right into the tasting part! I simply adore the chocolate, caramel and strawberry. Cacao used in the chocolate was deep and lovely. Caramel had the same aromatic scent as the roll. Normally, I am not a fan of strawberry but this one had a beautiful natural flavor of strawberry. Pistachio was average for me as I did not really taste much of it. Maybe the other three had stronger flavors? I haven’t had a French Pithivier since my college days. When I found out that it’s available here, I begged for an order of this! Warmed puff pastry encasing moist almond paste and served with cold Vanilla ice cream had me singing for joy. This one was beautifully made and I love the speckled vanilla in the ice cream. The highest peak of desserts was the Apple Tart Galette with Vanilla Ice Cream. Everyone was surprise at how scrumptious this brittle galette tasted. The texture was a brittle and chewy delight with a caramel undertone and the ice cream went perfectly with it. This is a must order and I am going to have one all by myself the next time I dine here!